Even though most of us still open doors using a key, there are other more modern methods we can use to secure doors where a key wouldn’t be practical. Digital locks provide a practical and easy solution in some instances, and the Pixlocks team is experienced in installing them and providing advice to those who need it. Digital door locks come in a variety of brands and finishes, but the idea behind each one is the same. 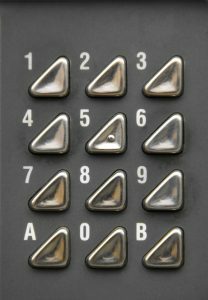 You have a door lock installed in conjunction with a keypad, and it will only open once the correct code has been entered on the panel. The panel usually consists of a series of push-button keys, so the right code can be entered and the door will automatically unlock. These are ideal to use inside premises where certain areas need to be off-limits to some people. For example, hospitals make good use of these to limit access to wards, storage areas and other spaces where only a few people are permitted to go. They can also be used for businesses and even in nursing and care homes, not to mention a variety of other circumstances. With no need to carry keys around and no concerns over losing keys or key cards, this type of entry system works well for all manner of circumstances. It is also a very affordable and secure method of entry, so if you want to find out whether digital locks would be ideal for you, contact our Hull locksmith team today to discuss the possibilities. We can supply and install digital door locks on one or more doors for you very soon, depending on where you want them and how you want to use them. Installation is easy and doesn’t require a lot of work, so you could be benefiting from your new door security measures in no time at all. And remember, our Hull locksmiths have been trained and qualified in locks, installation and security so you can rest assured you are getting the very best service when you need it. Trust in Pixlocks and call us today.